As good as they are gorgeous! These cookies are one of my favorites yet I have never encountered them anywhere. I like to make them during the holidays when fresh cranberries are available but they are good anytime.. The red chunks of fruit and the white and dark chocolate drizzle make them attractive on a cookie platter. Their texture is moist with the nice crunch of the toasted almonds. It’s no secret I am more comfortable cooking than baking. I eagerly accept invitations to cookie exchanges every Christmas so I can trade my cookies for those perfect sugar cut-outs with intricate icing designs, you know the ones I mean? These cookies are the ones I will be exchanging this year. Fair trade? Must be, I get invited back! Method: Preheat oven to 375F. Line your baking sheet with parchment. Cream butter with 2 sugars. Add almond extract, and eggs and beat well. Combine flour, salt and baking powder then add gradually to the butter until just incorporated. Fold in the cranberries and toasted almonds. Drop by heaping tablespoons on the baking sheet, 2 inches apart. Bake 9-11 minutes. Cool on baking sheet as the cookies will be soft. To glaze: melt 3 oz of each dark and white cocolate. Using an icing bag or a ziplock bag with the end cut, drizzle a light zig zag pattern of first the dark then the white chocolate on each cookie. Run a toothpick through the chocolate to create a fancier design. The glaze is optional as the cookies are good plain also! Delicious at Christmas or anytime! 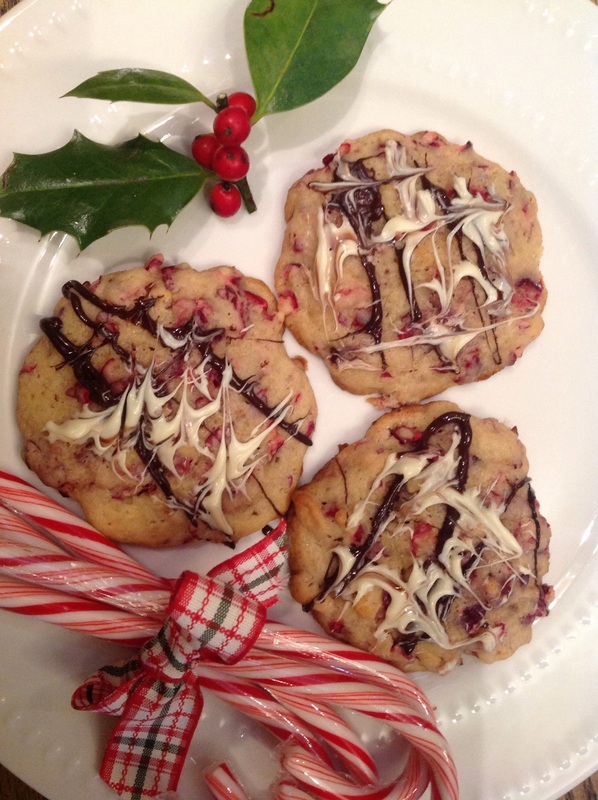 This entry was posted in Edible gifting, Recipes and tagged double chocolate glazed cranberry almond cookies, Fresh cranberry cookies with toasted almonds by Johanne Lamarche. Bookmark the permalink. These look beautiful. I LOVE the effect that the toothpick has made on the drizzle. You’d be welcome to one of my cookie exchanges anytime!!! 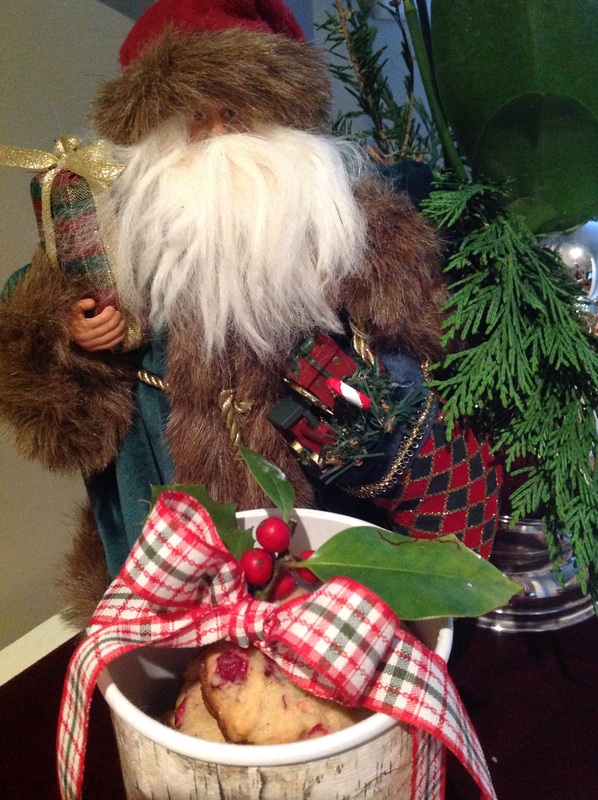 What is your favorite cookie to make and take to cookie exchanges? These sound delicious! I prefer fresh cranberries to dried and am often disappointed when I go to a recipe and discover that the ingredient is the dried berry. I’ll give these a try soon. I agree, they are a pretty addition to a tray! I would never have thought to use fresh cranberries in a cookie – wow! They must be just bursting with flavour. Love the fancy chocolate on top too – I can see why you are always invited back! You are too kind Selma. The cookies are indeed bursting w the tartness of the fresh cranberries but that drizzle is NOT well executed, hence my challenge with the fancy part of cookie baking! I am taking plain ones tonight :))) i can’t seem to get in on FF today. Mkeep getting sent into a dog food blog and there have been no new additions to the postings in several hours. Did you have any problems? Oh that sounds really weird!! Mine went through fine. Were you linking up to the FF 46 post? Yes I finally went into the dog food post ahead of the icon and from there I found the FF listings! Some kind of bug!!! Oh these are so pretty Johanne! Very fancy and impressive! I bet the flavors are sensational!